1 A None No Power Seat 1 A is a standard Business Class seat that transforms into a fully flat bed. The proximity to the lavatory and galley may be bothersome. There is no floor storage for these seats during takeoff and landing. 1 B None No Power Seat 1 B is a standard Business Class seat that transforms into a fully flat bed. The proximity to the lavatory and galley may be bothersome. There is no floor storage for these seats during takeoff and landing. 1 D None No Power Seat 1 D is a standard Business Class seat that transforms into a fully flat bed. The proximity to the lavatory and galley may be bothersome. There is no floor storage for these seats during takeoff and landing. 1 G None No Power Seat 1 G is a standard Business Class seat that transforms into a fully flat bed. The proximity to the lavatory and galley may be bothersome. There is no floor storage for these seats during takeoff and landing. 1 H None No Power Seat 1 H is a standard Business Class seat that transforms into a fully flat bed. The proximity to the lavatory and galley may be bothersome. There is no floor storage for these seats during takeoff and landing. 1 J None No Power Seat 1 J is a standard Business Class seat that transforms into a fully flat bed. The proximity to the lavatory and galley may be bothersome. There is no floor storage for these seats during takeoff and landing. 10 A None No Power Seat 10 A is a standard Economy Comfort seat. The seat is in the Economy Comfort Zone and is available for selection for an additional fee. This seat is missing a window. 10 B None No Power Seat 10 B is a standard Economy Comfort seat. The seat is in the Economy Comfort Zone and is available for selection for an additional fee. 10 G None No Power Seat 10 G is a standard Economy seat. 10 H None No Power Seat 10 H is a standard Economy Comfort seat. The seat is in the Economy Comfort Zone and is available for selection for an additional fee. 10 J None No Power Seat 10 J is a standard Economy Comfort seat. The seat is in the Economy Comfort Zone and is available for selection for an additional fee. This seat is missing a window. 11 G None No Power Seat 11 G is a standard Economy seat. 11 H None No Power Seat 11 H is a standard Economy seat. 11 J None No Power Seat 11 J is a standard Economy seat. 12 G None No Power Seat 12 G is a standard Economy seat. 12 H None No Power Seat 12 H is a standard Economy seat. 12 J None No Power Seat 12 J is a standard Economy seat. 14 G None No Power Seat 14 G is a standard Economy seat. 14 H None No Power Seat 14 H is a standard Economy seat. 14 J None No Power Seat 14 J is a standard Economy seat. 15 G None No Power Seat 15 G is a standard Economy seat. 15 H None No Power Seat 15 H is a standard Economy seat. 15 J None No Power Seat 15 J is a standard Economy seat. 16 G None No Power Seat 16 G is a standard Economy seat. 16 H None No Power Seat 16 H is a standard Economy seat. 16 J None No Power Seat 16 J is a standard Economy seat. 17 G None No Power Seat 17 G is a standard Economy seat. 17 H None No Power Seat 17 H is a standard Economy seat. 17 J None No Power Seat 17 J is a standard Economy seat. 18 G None No Power Seat 18 G is a standard Economy seat. 18 H None No Power Seat 18 H is a standard Economy seat. 18 J None No Power Seat 18 J is a standard Economy seat. 19 G None No Power Seat 19 G is a standard Economy seat. 19 H None No Power Seat 19 H is a standard Economy seat. 19 J None No Power Seat 19 J is a standard Economy seat. 2 B None No Power Seat 2 B is a standard Business Class seat that transforms into a fully flat bed. 2 G None No Power Seat 2 G is a standard Business Class seat that transforms into a fully flat bed. 2 H None No Power Seat 2 H is a standard Business Class seat that transforms into a fully flat bed. 20 G None No Power Seat 20 G is a standard Economy seat. 20 H None No Power Seat 20 H is a standard Economy seat. 20 J None No Power Seat 20 J is a standard Economy seat. 21 G None No Power Seat 21 G is a standard Economy seat. 21 H None No Power Seat 21 H is a standard Economy seat. 21 J None No Power Seat 21 J is a standard Economy seat. 22 A None No Power Seat 22 A is a standard Economy seat. 22 B None No Power Seat 22 B is a standard Economy seat. 22 D None No Power Seat 22 D is a standard Economy seat. 22 E None No Power Seat 22 E is a standard Economy seat. 22 F None No Power Seat 22 F is a standard Economy seat. 22 G None No Power Seat 22 G is a standard Economy seat. 22 H None No Power Seat 22 H is a standard Economy seat. 22 J None No Power Seat 22 J is a standard Economy seat. 23 A None No Power Seat 23 A is a standard Economy seat. 23 B None No Power Seat 23 B is a standard Economy seat. 23 D None No Power Seat 23 D is a standard Economy seat. 23 E None No Power Seat 23 E is a standard Economy seat. 23 F None No Power Seat 23 F is a standard Economy seat. 23 G None No Power Seat 23 G is a standard Economy seat. 23 H None No Power Seat 23 H is a standard Economy seat. 23 J None No Power Seat 23 J is a standard Economy seat. 24 A None No Power Seat 24 A is a standard Economy Class seat located in the last row of the forward Economy Class section. Seat back recline might be limited due to the lavatory wall directly behind. Also, if the seat back in front is reclined, then there will be a reduction of personal space. The proximity to the lavatory might be bothersome. 24 B None No Power Seat 24 B is a standard Economy Class seat located in the last row of the forward Economy Class section. Seat back recline might be limited due to the lavatory wall directly behind. Also, if the seat back in front is reclined, then there will be a reduction of personal space. The proximity to the lavatory might be bothersome. 24 D None No Power Seat 24 D is a standard Economy Class seat located in the last row of the forward Economy Class section. Seat back recline might be limited due to the lavatory wall directly behind. Also, if the seat back in front is reclined, then there will be a reduction of personal space. The proximity to the lavatory might be bothersome. 24 E None No Power Seat 24 E is a standard Economy Class seat located in the last row of the forward Economy Class section. Seat back recline might be limited due to the lavatory wall directly behind. Also, if the seat back in front is reclined, then there will be a reduction of personal space. The proximity to the lavatory might be bothersome. 24 F None No Power Seat 24 F is a standard Economy Class seat located in the last row of the forward Economy Class section. Seat back recline might be limited due to the lavatory wall directly behind. Also, if the seat back in front is reclined, then there will be a reduction of personal space. The proximity to the lavatory might be bothersome. 24 G None No Power Seat 24 G is a standard Economy Class seat located in the last row of the forward Economy Class section. Seat back recline might be limited due to the lavatory wall directly behind. Also, if the seat back in front is reclined, then there will be a reduction of personal space. The proximity to the lavatory might be bothersome. 24 H None No Power Seat 24 H is a standard Economy Class seat located in the last row of the forward Economy Class section. Seat back recline might be limited due to the lavatory wall directly behind. Also, if the seat back in front is reclined, then there will be a reduction of personal space. The proximity to the lavatory might be bothersome. 24 J None No Power Seat 24 J is a standard Economy Class seat located in the last row of the forward Economy Class section. Seat back recline might be limited due to the lavatory wall directly behind. Also, if the seat back in front is reclined, then there will be a reduction of personal space. The proximity to the lavatory might be bothersome. 3 A None No Power Seat 3 A is a standard Business Class seat that transforms into a fully flat bed. The proximity to the galleys may be bothersome. 3 B None No Power Seat 3 B is a standard Business Class seat that transforms into a fully flat bed. The proximity to the galleys may be bothersome. 3 D None No Power Seat 3 D is a standard Business Class seat that transforms into a fully flat bed. The proximity to the galleys may be bothersome. 3 G None No Power Seat 3 G is a standard Business Class seat that transforms into a fully flat bed. The proximity to the galleys may be bothersome. 3 H None No Power Seat 3 H is a standard Business Class seat that transforms into a fully flat bed. The proximity to the galleys may be bothersome. 3 J None No Power Seat 3 J is a standard Business Class seat that transforms into a fully flat bed. The proximity to the galleys may be bothersome. 30 A None No Power Seat 30 A is a standard Economy Class seat located in an Exit Row. The seat features additional legroom. The tray table and inflight entertainment monitor are installed in the armrest, therefore, the armrest is immovable and seat width is slightly reduced. Floor storage for personal effects is not available for use during takeoff and landing. The proximity to the lavatory area might be bothersome. 30 B None No Power Seat 30 B is a standard Economy Class seat located in an Exit Row. The seat features additional legroom. The tray table and inflight entertainment monitor are installed in the armrest, therefore, the armrest is immovable and seat width is slightly reduced. Floor storage for personal effects is not available for use during takeoff and landing. The proximity to the lavatory area might be bothersome. 30 D None No Power Seat 30 D is a standard Economy Class seat located in an Exit Row. The seat features additional legroom. The tray table and inflight entertainment monitor are installed in the armrest, therefore, the armrest is immovable and seat width is slightly reduced. Floor storage for personal effects is not available for use during takeoff and landing. The proximity to the lavatory area might be bothersome. 30 E None No Power Seat 30 E is a standard Economy Class seat located in an Exit Row. The seat features additional legroom. The tray table and inflight entertainment monitor are installed in the armrest, therefore, the armrest is immovable and seat width is slightly reduced. Floor storage for personal effects is not available for use during takeoff and landing. The proximity to the lavatory area might be bothersome. 30 F None No Power Seat 30 F is a standard Economy Class seat located in an Exit Row. The seat features additional legroom. The tray table and inflight entertainment monitor are installed in the armrest, therefore, the armrest is immovable and seat width is slightly reduced. Floor storage for personal effects is not available for use during takeoff and landing. The proximity to the lavatory area might be bothersome. 30 G None No Power Seat 30 G is a standard Economy Class seat located in an Exit Row. The seat features additional legroom. The tray table and inflight entertainment monitor are installed in the armrest, therefore, the armrest is immovable and seat width is slightly reduced. Floor storage for personal effects is not available for use during takeoff and landing. The proximity to the lavatory area might be bothersome. 30 H None No Power Seat 30 H is a standard Economy Class seat located in an Exit Row. The seat features additional legroom. The tray table and inflight entertainment monitor are installed in the armrest, therefore, the armrest is immovable and seat width is slightly reduced. Floor storage for personal effects is not available for use during takeoff and landing. The proximity to the lavatory area might be bothersome. 30 J None No Power Seat 30 J is a standard Economy Class seat located in an Exit Row. The seat features additional legroom. The tray table and inflight entertainment monitor are installed in the armrest, therefore, the armrest is immovable and seat width is slightly reduced. Floor storage for personal effects is not available for use during takeoff and landing. The proximity to the lavatory area might be bothersome. 39 D None No Power Seat 39 D is a standard Economy Class seat. The seat might be bumped by passengers and crew passing from the back of the aircraft. 39 G None No Power Seat 39 G is a standard Economy Class seat. The seat might be bumped by passengers and crew passing from the back of the aircraft. 40 D None No Power Seat 40 D is a standard Economy Class seat. The inflight entertainment, tray table, and floor storage alignment of the seat to the one in front might be bothersome. 40 E None No Power Seat 40 E is a standard Economy Class seat. The inflight entertainment, tray table, and floor storage alignment of the seat to the one in front might be bothersome. 40 G None No Power Seat 40 G is a standard Economy Class seat. The inflight entertainment, tray table, and floor storage alignment of the seat to the one in front might be bothersome. 42 A None No Power Seat 42 A is a standard Economy Class seat located in the last row of the aircraft. Seat back recline might be limited due to the wall of a bulkhead directly behind. Also, if the seat back in front is reclined, then there will be a reduction of personal space. The proximity to the galley area might be bothersome. 42 B None No Power Seat 42 B is a standard Economy Class seat located in the last row of the aircraft. Seat back recline might be limited due to the wall of a bulkhead directly behind. Also, if the seat back in front is reclined, then there will be a reduction of personal space. The proximity to the galley area might be bothersome. 43 D None No Power Seat 43 D is a standard Economy Class seat located in the last row of the aircraft. Seat back recline might be limited due to the wall of a bulkhead directly behind. Also, if the seat back in front is reclined, then there will be a reduction of personal space. The proximity to the galley and lavatory area might be bothersome. 43 E None No Power Seat 43 E is a standard Economy Class seat located in the last row of the aircraft. Seat back recline might be limited due to the wall of a bulkhead directly behind. Also, if the seat back in front is reclined, then there will be a reduction of personal space. The proximity to the galley and lavatory area might be bothersome. 43 G None No Power Seat 43 G is a standard Economy Class seat located in the last row of the aircraft. Seat back recline might be limited due to the wall of a bulkhead directly behind. Also, if the seat back in front is reclined, then there will be a reduction of personal space. The proximity to the galley area might be bothersome. 43 H None No Power Seat 43 H is a standard Economy Class seat located in the last row of the aircraft. Seat back recline might be limited due to the wall of a bulkhead directly behind. Also, if the seat back in front is reclined, then there will be a reduction of personal space. The proximity to the galley area might be bothersome. 43 J None No Power Seat 43 J is a standard Economy Class seat located in the last row of the aircraft. Seat back recline might be limited due to the wall of a bulkhead directly behind. Also, if the seat back in front is reclined, then there will be a reduction of personal space. The proximity to the galley area might be bothersome. 6 A None No Power Seat 6 A is a standard Economy Comfort Class seat that has extra legroom due to the bulkhead separating World Business Class and Economy Class. The proximity to the galleys may be bothersome. The tray tables are in the armrests making the armrests immovable and slightly reducing seat width. There is no floor storage for these seats during takeoff and landing. The seat is in the Economy Comfort Zone and is available for selection for an additional fee. 6 B None No Power Seat 6 B is a standard Economy Comfort Class seat that has extra legroom due to the bulkhead separating World Business Class and Economy Class. The proximity to the galleys may be bothersome. The tray tables are in the armrests making the armrests immovable and slightly reducing seat width. There is no floor storage for these seats during takeoff and landing. The seat is in the Economy Comfort Zone and is available for selection for an additional fee. 6 D None No Power Seat 6 D is a standard Economy Comfort Class seat that has extra legroom due to the bulkhead separating World Business Class and Economy Class. The proximity to the galleys may be bothersome. The tray tables are in the armrests making the armrests immovable and slightly reducing seat width. There is no floor storage for these seats during takeoff and landing. The seat is in the Economy Comfort Zone and is available for selection for an additional fee. 6 E None No Power Seat 6 E is a standard Economy Comfort Class seat that has extra legroom due to the bulkhead separating World Business Class and Economy Class. The proximity to the galleys may be bothersome. The tray tables are in the armrests making the armrests immovable and slightly reducing seat width. There is no floor storage for these seats during takeoff and landing. The seat is in the Economy Comfort Zone and is available for selection for an additional fee. 6 F None No Power Seat 6 F is a standard Economy Comfort Class seat that has extra legroom due to the bulkhead separating World Business Class and Economy Class. The proximity to the galleys may be bothersome. The tray tables are in the armrests making the armrests immovable and slightly reducing seat width. There is no floor storage for these seats during takeoff and landing. The seat is in the Economy Comfort Zone and is available for selection for an additional fee. 6 G None No Power Seat 6 G is a standard Economy Comfort Class seat that has extra legroom due to the bulkhead separating World Business Class and Economy Class. The proximity to the galleys may be bothersome. The tray tables are in the armrests making the armrests immovable and slightly reducing seat width. There is no floor storage for these seats during takeoff and landing. The seat is in the Economy Comfort Zone and is available for selection for an additional fee. 6 H None No Power Seat 6 H is a standard Economy Comfort Class seat that has extra legroom due to the bulkhead separating World Business Class and Economy Class. The proximity to the galleys may be bothersome. The tray tables are in the armrests making the armrests immovable and slightly reducing seat width. There is no floor storage for these seats during takeoff and landing. The seat is in the Economy Comfort Zone and is available for selection for an additional fee. 6 J None No Power Seat 6 J is a standard Economy Comfort Class seat that has extra legroom due to the bulkhead separating World Business Class and Economy Class. The proximity to the galleys may be bothersome. The tray tables are in the armrests making the armrests immovable and slightly reducing seat width. There is no floor storage for these seats during takeoff and landing. The seat is in the Economy Comfort Zone and is available for selection for an additional fee. 7 A None No Power Seat 7 A is a standard Economy Comfort seat. The seat is in the Economy Comfort Zone and is available for selection for an additional fee. 7 B None No Power Seat 7 B is a standard Economy Comfort seat. The seat is in the Economy Comfort Zone and is available for selection for an additional fee. 7 D None No Power Seat 7 D is a standard Economy Comfort seat. The seat is in the Economy Comfort Zone and is available for selection for an additional fee. 7 E None No Power Seat 7 E is a standard Economy Comfort seat. The seat is in the Economy Comfort Zone and is available for selection for an additional fee. 7 F None No Power Seat 7 F is a standard Economy Comfort seat. The seat is in the Economy Comfort Zone and is available for selection for an additional fee. 7 G None No Power Seat 7 G is a standard Economy Comfort seat. The seat is in the Economy Comfort Zone and is available for selection for an additional fee. 7 H None No Power Seat 7 H is a standard Economy Comfort seat. The seat is in the Economy Comfort Zone and is available for selection for an additional fee. 7 J None No Power Seat 7 J is a standard Economy Comfort seat. The seat is in the Economy Comfort Zone and is available for selection for an additional fee. 8 A None No Power Seat 8 A is a standard Economy Comfort seat. The seat is in the Economy Comfort Zone and is available for selection for an additional fee. 8 B None No Power Seat 8 B is a standard Economy Comfort seat. The seat is in the Economy Comfort Zone and is available for selection for an additional fee. 8 D None No Power Seat 8 D is a standard Economy Comfort seat. The seat is in the Economy Comfort Zone and is available for selection for an additional fee. 8 E None No Power Seat 8 E is a standard Economy Comfort seat. The seat is in the Economy Comfort Zone and is available for selection for an additional fee. 8 F None No Power Seat 8 F is a standard Economy Comfort seat. The seat is in the Economy Comfort Zone and is available for selection for an additional fee. 8 G None No Power Seat 8 G is a standard Economy Comfort seat. The seat is in the Economy Comfort Zone and is available for selection for an additional fee. 8 H None No Power Seat 8 H is a standard Economy Comfort seat. The seat is in the Economy Comfort Zone and is available for selection for an additional fee. 8 J None No Power Seat 8 J is a standard Economy Comfort seat. The seat is in the Economy Comfort Zone and is available for selection for an additional fee. 9 A None No Power Seat 9 A is a standard Economy Comfort seat. The seat is in the Economy Comfort Zone and is available for selection for an additional fee. 9 B None No Power Seat 9 B is a standard Economy Comfort seat. The seat is in the Economy Comfort Zone and is available for selection for an additional fee. 9 D None No Power Seat 9 D is a standard Economy Comfort seat. The seat is in the Economy Comfort Zone and is available for selection for an additional fee. 9 E None No Power Seat 9 E is a standard Economy Comfort seat. The seat is in the Economy Comfort Zone and is available for selection for an additional fee. 9 F None No Power Seat 9 F is a standard Economy Comfort seat. The seat is in the Economy Comfort Zone and is available for selection for an additional fee. 9 G None No Power Seat 9 G is a standard Economy Comfort seat. The seat is in the Economy Comfort Zone and is available for selection for an additional fee. 9 H None No Power Seat 9 H is a standard Economy Comfort seat. The seat is in the Economy Comfort Zone and is available for selection for an additional fee. 9 J None No Power Seat 9 J is a standard Economy Comfort seat. The seat is in the Economy Comfort Zone and is available for selection for an additional fee. World Business Class features noise reducing headsets and 16 audio channels with audio on demand and a cool personalized Jukebox feature. Coach features audio entertainment too but no special headphones, bring your own for better quality. All seats are equipped with Panasonic eX2 Audio and Video onDemand system, providing both World Business Class and economy class passengers with individual screens and control panels so they can start and stop their personal entertainment program at their leisure. The personal LCD widescreens in economy are 9 inches and those in WBC are 10.4 inches. Passengers flying in World Business have access to AC power ports. Meal and beverage service is offered in all classes on intercontinental flights. Flying Blue Platinum members and passengers with fully flexible Economy tickets pay nothing extra for an Economy Comfort seat. Flying Blue Gold members receive a 50% discount and Flying Blue Silver members pay 25% less. Good seat, enough room and nice recline. Since there is one seat missing, because of the frame, the aisle is larger then normal. So there is more space and not much bumping from the crew. There is no toilet in the back, so it is not busy. There was a new entertainment system and no metal box that blocked any legroom. There was a USB port to charge your phone and the food was good. The seats on this aircraft are very narrow and uncomfortable. The IFE screens are also very small. 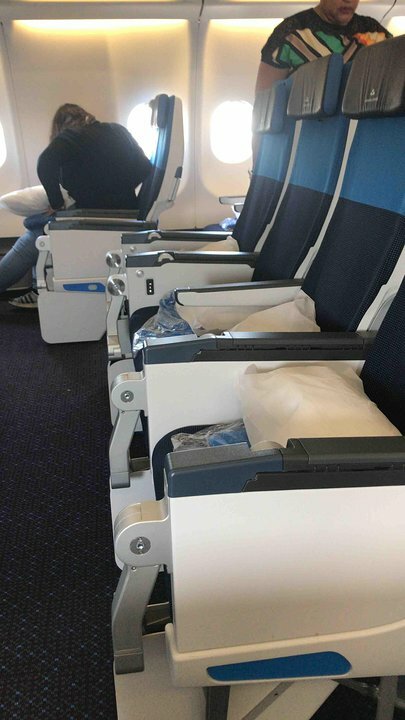 Seats on our return flight on an A330-300 were much better. KLM needs to bring this aircraft up to date even though they are not that old. This seat is really bad. The plane is old, so no power outlet. The metal box for the computer entertainment system is under the seat in front, so half leg space is gone. The window is useless, as you only see the wing. BAD SEATS! Row 11AB & 11HJ are the first rows behind the last row of Economy Comfort (extra recline + extra legroom) row 10AB & 10HJ. Row 11AB & HJ have no extra legroom and no extra recline! So when the pax in row 10AB & 10HJ reclines his/her seat fully, pax in row 11AB & 11HJ get really stuck! Avoid row 11AB & 11HJ! BAD SEATS! Row 10DEFG is the first row behind the last row of Economy Comfort (extra recline + extra legroom) row 9 DEFG. Row 10 DEFG has no extra legroom and no extra recline! So when the pax in row 9DEFG reclines his/her seat fully, pax in row 10DEFG get really stuck! Avoid that row 10 DEFG! Yes, you get more legroom for your extra money (although the metal box on the floor is annoying). No, the width is the same as on regular seats and that means, it´s much too small. No window at this seat (also applies to 10J). Power seems to be available at least in Economy Comfort. KLM flies 2 versions of Airbus A330-200.